This is a list of the natural ingredients found in the different brands of Nrf2 Activators. If you don't want to buy a brand, you can try combining several ingredients yourself. Ingredients can be bought at a grocery store, health food store, or on health food websites. Combinations create a synergistic effect (making each part more potent than if taken alone). For example, each Protandim ingredient is increased to 18 times the potency when put in a mixture. Beware of exactly copying a brand though - companies have spent decades of research and lots of money developing a product that works, and they protect their creations legally with patents. Acai: One laboratory study found that commercially available açaí powder added to the diet of fruit flies lengthened their lives when challenged by chemical or genetic oxidative stress. Aronia berries are used in juice blends for color and marketed for their antioxidant properties. Ashwagandha: The plant's long, brown, tuberous roots are used in traditional medicine. In Ayuverda, the berries and leaves are applied externally to tumors, tubercular glands, carbuncles, and ulcers. The roots are used to prepare the herbal remedy ashwagandha, which has been traditionally used for various symptoms and conditions. Bacopa: This herb is important in Ayurvedic medicine, and has been used, particularly in India, for several thousand years to improve mental functioning, including comprehension and memory. Black Currant: The fruit has very high vitamin C content (several times the recommended daily dietary reference intake per 100 g), good levels of potassium, phosphorus, iron, manganese and vitamin B5, and a broad range of other essential nutrients. Other phytochemicals in the fruit (polyphenols/anthocyanins) have been demonstrated in laboratory experiments with potential to inhibit inflammation mechanisms suspected to be at the origin of heart disease, cancer, microbial infections or neurological disorders like Alzheimer's disease. Major anthocyanins in blackcurrant pomace are delphinidin-3-O-glucoside, delphinidin-3-O-rutinoside, cyanidin-3-O-glucoside, and cyanidin-3-O-rutinoside which are retained in the juice concentrate among other yet unidentified polyphenols. Blackcurrant seed oil is also rich in many nutrients, especially vitamin E and several unsaturated fatty acids including alpha-linolenic acid and gamma-linolenic acid. There is some evidence that gamma-linolenic acid may boost the effectiveness of the immune system and that use of the oil can reduce total cholesterol and triglycerides while increasing beneficial high-density cholesterol. In vitro, blackcurrant juice was found to have high antioxidant content and a potent free radical scavenger. The leaves have traditionally been used for arthritis, spasmodic cough, diarrhea, as a diuretic and for treating a sore throat. The berries were made into a drink thought to be beneficial for treatment of colds and flu, for other fevers, for diaphoresis and as a diuretic. In traditional Austrian medicine, Ribes nigrum fruits have been used internally (consumed whole or as a syrup) for treatment of infections and disorders of the gastrointestinal tract, the locomotor system, the respiratory tract and the cardiovascular system. Black Pepper: Black Pepper (BioPerine) assists in the absorption of selenomethionine, vitamin C and curcumin (turmeric root). Black Soybean: Black soy beans are merely a variety of soy bean. Nutritionally, they are very similar to regular yellow soy beans, though they are higher in some phytonutrients, including antioxidants. They are low in net carbohydrates, and high in fiber, protein, vitamin K, iron, magnesium, copper, manganese, and riboflavin. Blackberry: Blackberries are notable for their high nutritional contents of dietary fiber, vitamin C, vitamin K, and the essential mineral manganese. Blackberries have both soluble and insoluble fiber. One cup of blackberries (144 g) has an average of 7.6 g of fiber and contains half the daily recommended dose of vitamin C. Dietary fiber is important in maintaining a healthy digestive system, as it supports regular bowel movements. Blackberries contain numerous large seeds that are not always preferred by consumers. The seeds contain oil rich in omega-3 (alpha-linolenic acid) and -6 fats (linoleic acid) as well as protein, dietary fiber, carotenoids, ellagitannins and ellagic acid. Blue corn: Blue corn has several nutritional advantages over standard yellow or white corn varieties. It contains 20 percent more protein and has a lower glycemic index than white corn. When used to make tortillas, blue corn produces a sweeter, nuttier taste than yellow or white corn, and is a more complete protein source. A certain technique is used to grind the blue maize to make it release niacin. Broccoli: Broccoli is high in vitamin C and dietary fiber. It also contains multiple nutrients with potent anti-cancer properties, such as diindolylmethane and small amounts of selenium. A single serving provides more than 30 mg of vitamin C and a half-cup provides 52 mg of vitamin C. The 3,3'-Diindolylmethane found in broccoli is a potent modulator of the innate immune response system with anti-viral, anti-bacterial and anti-cancer activity. Broccoli also contains the compound glucoraphanin, which can be processed into an anti-cancer compound sulforaphane, though the anti-cancer benefits of broccoli are greatly reduced if the vegetable is boiled. Broccoli is also an excellent source of indole-3-carbinol, a chemical which boosts DNA repair in cells and appears to block the growth of cancer cells. Broccoli Seed: Broccoli Seed Extract (sulforaphane glucosinolate) acts as a catalyst to boost antioxidant activity for as much as three days. It protects against DNA damaging electrophiles and helps cells neutralize toxins and carcinogens so they are eliminated from cells. It also helps to raise and replenish glutathione levels and induces the antioxidant enzymes used in the Phase II detoxification pathway. Broccoli sprouts: Broccoli sprouts are three- to four-day-old broccoli plants that look like alfalfa sprouts, but taste like radishes. The radish flavor comes from a phytochemical that may act as protection against bacteria, viruses, and fungi while the broccoli plant is still young. This phytochemical not only benefits the young plant, but also when eaten by humans, may act as an antioxidant to stimulate the ability of cells to protect against disease. Brussels sprouts: Raw Brussels sprouts contain excellent levels of vitamin C and vitamin K, with more moderate amounts of B vitamins, such as folic acid; and essential minerals and dietary fibre exist in lesser amounts. Brussels sprouts, as with broccoli and other brassicas, contain sulforaphane, a phytochemical under basic research for its potential anticancer properties. Brussels sprouts and other brassicas are also a source of indole-3-carbinol, a chemical being studied for how it affects DNA repair in cells and appears to block the growth of cancer cells in vitro. Calcium: Calcium is an important component of a healthy diet and a mineral necessary for life. The National Osteoporosis Foundation says, "Calcium plays an important role in building stronger, denser bones early in life and keeping bones strong and healthy later in life." Approximately 99 percent of the body's calcium is stored in the bones and teeth. The rest of the calcium in the body has other important uses, such as some exocytosis, especially neurotransmitter release, and muscle contraction. In the electrical conduction system of the heart, calcium replaces sodium as the mineral that depolarizes the cell, proliferating the action potential. In cardiac muscle, sodium influx commences an action potential, but during potassium efflux, the cardiac myocyte experiences calcium influx, prolonging the action potential and creating a plateau phase of dynamic equilibrium. Carrot: The carrot gets its characteristic, bright orange colour from β-carotene, and lesser amounts of α-carotene, γ-carotene, lutein and zeaxanthin. α and β-carotenes are partly metabolized into vitamin A, providing more than 100% of the Daily Value (DV) per 100 g serving of carrots. Carrots are also a good source of dietary fiber (11% DV), vitamin K (16% DV) and vitamin B6 (11% DV). Coffee Berry: CoffeeBerry is abundant in polyphenols that help preserve natural antioxidants in the body, protect cell membranes and human plasma against damaging oxidation, neutralize toxic free radicals, and help maintain healthy blood glucose levels already in normal range. CoffeeBerry contains five of eight rare and essential sugars called monosaccharides. Research indicates these glyconutrients are essential for the various complex biological systems to interact and function properly to prevent free-radical damage and to initiate cellular repair. Cordyceps: Cordyceps has been used as a Chinese medicine for centuries and has been valued for its activity in restoring energy, increasing stamina, promoting longevity and improving quality of life. Cranberry: Raw cranberries are a source of phytochemicals, particularly polyphenols which are under active research for possible effects on the cardiovascular system, immune system and cancer, such as in isolated prostate cancer cells. Cranberry juice contains a high molecular weight non-dializable material that is under research for its potential to affect formation of plaque by Streptococcus mutans pathogens that cause tooth decay. Cranberry juice components are also being studied for possible effects on kidney stone formation. Cranberry juice is an abundant food source of proanthocyanidins and flavonols and quercetin. which are being studied in vitro. Cranberry tannins may interact with proteins and possibly digestive enzymes, α-amylase and glucoamylase, which in turn may affect starch hydrolysis. Curcumin: Curcumin, a substance in turmeric, may help to reduce inflammation. Several studies suggest that it might ease symptoms of osteoarthritis and rheumatoid arthritis, like pain and inflammation. Other compounds in turmeric might also be medicinal. In lab tests, curcumin seems to block the growth of certain kinds of tumors. One study showed that turmeric extract containing curcumin could -- in some cases -- stabilize colorectal cancer that wasn't helped by other treatments. Other preliminary lab studies suggest that curcumin or turmeric might protect against types of skin diseases, Alzheimer's disease, colitis, stomach ulcers, and high cholesterol. Based on lab studies, turmeric and curcumin might also help treat upset stomach, scabies, diabetes, HIV, uveitis, and viral infections. Glucoraphanin: Glucoraphanin is a glucosinolate found in broccoli and cauliflower, in particular in the young sprouts. When these foods are consumed, the enzyme myrosinase transforms glucoraphanin into raphanin, which is an antibiotic, and into sulforaphane, which exhibits anti-cancer and antimicrobial properties in experimental models. Preliminary research also suggests that glucoraphanin may slow and prevent arthritis, and 'retune' mitochondrial metabolism. Grape Seed: Grape Seeds have antioxidant activity, as well as anti-inflammatory properties. Resveratrol is found in widely varying amounts among grape varieties, primarily in their skins and seeds, which, in muscadine grapes, have about one hundred times higher concentration than pulp. Laboratory tests indicated a potential anticancer effect from grape seed extract. Green Tea: Many claims have been made for the beneficial health effects of green tea consumption, but they have generally not been borne out by scientific investigation. Excessive consumption is associated with some harmful health effects, such as liver toxicity and increased oxidative stress. Regardless, claims have been made that it treats cancer, reduces risk of stroke, reduces blood pressure, reduces blood sugar, and reduces cholesterol. Kale: Kale is very high in beta carotene, vitamin K, vitamin C, and rich in calcium. Kale is a source of two carotenoids, lutein and zeaxanthin. Kale, as with broccoli and other brassicas, contains sulforaphane (particularly when chopped or minced), a chemical with potent anti-cancer properties. Along with other brassica vegetables, kale is also a source of indole-3-carbinol, a chemical which boosts DNA repair in cells and appears to block the growth of cancer cells. Kale has been found to contain a group of resins known as bile acid sequestrants, which have been shown to lower cholesterol and decrease absorption of dietary fat. Magnesium Malates: There are 12 different mineral supplements containing Magnesium, and Magnesium Malate is one of them. Milk Thistle: Milk Thistle (silymarin) is a powerful antioxidant used to support a healthy liver by removing harmful toxins and heavy metals that are stored in the liver. It is used in traditional Chinese medicine to clear heat and relieve toxic material, to soothe the liver and to promote bile flow. Though its efficacy in treating diseases is still unknown, Milk Thistle is sometimes prescribed by herbalists to help treat liver diseases (cirrhosis, jaundice and hepatitis). Both in vitro and animal research suggest that Silibinin (syn. silybin, sylimarin I) may have hepatoprotective (antihepatotoxic) properties that protect liver cells against toxins. A study in 2007 did show activity against liver cancer cells in vitro. Its potent extract is used in medicine under the name. Silibinin is used against poisoning by amanitas, such as the Death Cap (Amanita phalloides) as well as in cerebral edema and acute hepatitis therapy. Silybum marianum extract has antifungal effects, preventing the growth of dermatophyte more than saprophyte fungi. One pilot study showed that milk thistle may be as effective as fluoxetine in treatment of obsessive-compulsive disorder. A study in 2010 found that eight major compounds that comprise silybum, are inhibitors of HCV RNA-dependent RNA polymerase, suggesting potential in treating Hepatitis C. Isosilybin A was described as the main component of Silybum marianum acting as partial agonist of the peroxisome proliferator-activated receptor type gamma, the current pharmacological target in metabolic syndrome and diabetes type 2. Various other unproven benefits of taking Milk Thistle extract include: Lowering cholesterol levels, Reducing cell damage caused by radiation and chemotherapy treatments, reducing insulin resistance in people with type 2 diabetes who also have cirrhosis, reducing the growth of cancer cells in breast, cervical, and prostate cancers, and preventing or treating Alzheimer's Disease. Muscadine Grape: As one of nature's richest sources of polyphenolic antioxidants, muscadines have been studied for their potential health benefits which include preliminary evidence for effects against cancer mechanisms. To date, in vitro studies have shown positive effects of muscadine phenolics against blood, colon and prostate cancers. In a randomized, double-blind, placebo-controlled crossover trial, 50 adults with coronary disease or ≥1 cardiac risk factor received muscadine grape seed supplementation (1300 mg daily) and placebo for 4 weeks. There was there was a significant increase in resting brachial artery diameter, though it is unknown why. Onion: Onions are excellent sources of vitamin C, sulphuric compounds, flavonoids and phytochemicals. Phytochemicals, or phytonutrients, are naturally occurring compounds in fruits and vegetables that are able to react with the human body to trigger healthy reactions. Flavonoids are responsible for pigments in many fruits and vegetables. Studies have shown that they may help reduce the risk of Parkinson's disease, cardiovascular disease and stroke. Prune: Prunes and their juice contain mild laxatives including phenolic and sorbitol. Prunes also contain dietary fiber. Prunes and prune juice are thus common home remedies for constipation. Prunes also have a high antioxidant content. Pterostilbenes: Pterostilbene is found in blueberries and grapes, and is related to resveratrol. Studies have shown that is reduces cholesterol, thus lowering risk of heart disease and stroke. It has been shown to lower blood glucose levels by as much as 56 percent, while simultaneously raising insulin and hemoglobin levels to near normal levels. It is an Nrf2 activator and as such has a potential role in the therapeutic intervention in combating pancreatic β-cell damage thereby improving diabetes management. Another study showed that rats that were fed blueberry extracts had a significant reversal in motor-skill decline due to aging as well as other cognitive impairments. A study with blueberries in a group of adults with age-related memory decline demonstrated a significant improvement in memory tests after just 12 weeks of drinking blueberry juice. Pterostilbene has potent anti-oxidant characteristics and possible cancer-fighting properties at concentrations similar to resveratrol. Efficacy data from a 2012 study showed that pterostilbene at high doses was associated with reduced blood pressure and minor weight loss. Purple Carrot: Eastern carrots were domesticated in Central Asia in the 10th century, and are commonly purple or yellow. The purple color common in these carrots comes from anthocyanin pigments. Carrots are known for their role in vision and eye health. They are a good source of dietary fiber, Vitamin K, and Vitamin B6. Quercetin: Quercetin is claimed to be a supporting flavonoid antioxidant that scavenges free radicals that can damage cells. However, the European Food Safety Authority evaluated possible health claims associated with consumption of quercetin, and found that no cause-and-effect relationship has been established for any physiological effect. The US FDA emphasizes that it is not a defined nutrient. It is a flavonol found in many fruits, vegetables, leaves and grains. Raspberry: Research indicates antioxidant and antiproliferative (chemopreventive) effects may be associated with phenolics and flavonoids in raspberries. In herbal medicine, raspberry leaves are reputed to be effective in regulating menses. Raspberry Seed: Raspberry seeds contain antioxidant-like phytonutrients including ellagitannins and anthocyanins that may help fight cancer, viruses, inflammation and a number of other conditions. Antioxidants scavenge and destroy cell-damaging substances, called free radicals, that can occur naturally in the body or from exposure to environmental toxins. Although ellagitannins exist in most berries, raspberries contain the highest levels. Redox Signaling Molecules: These are reactive molecules suspended in a base saline solution. A proprietary electrochemical process takes place to add them to the solution. The Redox Signaling Molecules, though a small percentage of the liquid base, are what bring the body into homeostasis by almost immediately entering tissues and cells to activate Nrf2 and bring about many protective effects. Resveratrol: Resveratrol is an antioxidant found in high concentrations in grape skin, also found in wines, with higher concentrations in red wine verse white wine. Resveratrol is thought to account in a large part for the so called 'French Paradox'. The French Paradox - the findings that the rate of coronary heart disease in France was observed to be lower than in other countries with a similar risk factor - has been attributed to the consumption of red wine. Resveratrol is an antioxidant known to have cardio-protective properties. RiboCeine: RiboCeine (also known as RibCys, or Rib Cys) is a patented molecule that has been shown to effectively deliver cysteine into the cell, enabling it to produce optimal amounts of glutathione. RiboCeine combines Ribose and Cysteine, nutrients that are naturally occurring in humans, to more effectively deliver cysteine directly to your cells. This compound is a demand-release nutrient, activated by the body’s cells. RiboCeine enters the bloodstream and is then used by the body to produce glutathione, the body’s master antioxidant, and ATP, the cell’s natural fuel and source of energy, when the body needs it. Selenomethionine: Selenomethionine (Selenium) is the essential catalytic component of the enzyme glutathione peroxidase (GPx) and is absolutely required for its function. Selenium is needed as selenomethionine for the antioxidant enzyme, glutathione peroxidase. The glutathione peroxidase enzyme is responsible for the detoxification of lipid peroxides, and glutathione is absolutely required to regenerate this enzyme. Spinach: Spinach has a high nutritional value. It is a rich source (> 20% of the Daily Value, DV) of vitamin A, vitamin C, vitamin K, magnesium, manganese, folate and iron. Spinach is a good source (10-19% of DV) of the B vitamins riboflavin and vitamin B6, vitamin E, calcium, potassium and dietary fiber. Strawberry: Strawberries are an excellent source of vitamin C, a good source of manganese, and provides several other vitamins and dietary minerals in lesser amounts. Strawberries contain a modest amount of essential unsaturated fatty acids in the achene (seed) oil. Research indicates that strawberry consumption may be associated with a decreased cardiovascular disease risk and that phytochemicals present in strawberries have anti-inflammatory or anticancer properties in laboratory studies. Sulforaphane: Sulforaphane has attracted recent research attention for its antioxidant properties, which may persist for hours after ingestion. Basic research on sulforaphane indicates potential for effects on mechanisms of human disease, including neurodegenerative disorders and cancer; In animal models sulforaphane appears to have a protective effect against diabetes-related kidney damage. Sulforaphane may have a neuroprotective effect that can aid recovery from spinal cord injury. Sulforaphene Glucosinolate: Sulforaphane Glucosinolate is an antioxidant found in broccoli sprouts which has been found to be a factor in preventing multiple diseases, including several types of cancer, high blood pressure, macular degeneration and stomach ulcers. Sweet Cherry: Medicine has been prepared from the stalks that is astringent, antitussive, and diuretic. Tart Cherry: Tart Cherry is closely related to the sweet cherry (Prunus avium), but has a fruit that is more acidic, has greater nutritional benefits, and may have greater medicinal effects. Tart cherries may be useful in alleviating sleep problems due to its high melatonin content, a compound critical in regulating the sleep-wake cycle in humans. Research is exploring whether tart cherries have a significant benefit in several medical applications (anti-inflammation and anti-microbial effects) that is much greater than that of the species in general. Tomato: Some studies have indicated that the lycopene in tomatoes may help prevent cancer. There has been some research interest in whether the lycopene in tomatoes might help in managing human neurodegenerative diseases. The lycopene from tomatoes has no effect on the risk of developing diabetes, but may help relieve the oxidative stress of people who already have diabetes. Trans-Pterostilbene: This is the same as Pterostilbene with the same molecular make-up, except that the molecule is a different shape and more stable (making it better for packaging). It is a natural dietary compound and the primary antioxidant component of blueberries. It has increased bioavailability in comparison to other stilbene compounds, which may enhance its dietary benefit and possibly contribute to a valuable clinical effect. Multiple studies have demonstrated the antioxidant activity of pterostilbene, illustrating both preventative and therapeutic benefits. The antioxidant activity of pterostilbene has been implicated in anticarcinogenesis, modulation of neurological disease, anti-inflammation, attenuation of vascular disease, and amelioration of diabetes. Trans-Resveratrol: This is the same as Resveratrol with the same molecular make-up, except that the molecule is a different shape and more stable (making it better for packaging). Resveratrol is an antioxidant found in high concentrations in grape skin, also found in wines, with higher concentrations in red wine verse white wine. Resveratrol is an antioxidant known to have cardio-protective properties. Turmeric: Turmeric Root Extract (Curcumin) is a potent antioxidant that fights free radicals and is known to reduce inflammation. Curcumin also induces Phase II enzymes that support the glutathione detoxification pathway. Turmeric Rhizome: Same as Turmeric. The Rhizome is just the main stem of the plant that grows underground and sends out roots and shoots from its nodes. Vitamin C: Vitamin C is an exogenous antioxidant that is considered a network antioxidant and known to support the immune system. Wild Bilberry: Most Bilberries in the world are not cultivated, but are collected from the wild. About a fifth of the land of Sweden is covered in Bilberry bushes. Laboratory studies in rats have provided evidence that bilberry consumption may inhibit or reverse eye disorders such as macular degeneration. Bilberries are recognized as a good source of flavonoids, some of which have antioxidant activity shown in laboratory studies. Wild Blueberry: Wild blueberry bushes are not planted or genetically manipulated, but they are pruned periodically and pests are managed. Blueberries repeatedly ranked in the U.S. diet as having one of the highest antioxidant capacities among all fruits, vegetables, spices and seasonings. Antioxidants are essential to optimizing health by helping to combat the free radicals that can damage cellular structures as well as DNA. In a study involving older adults (with an average age of 76 years), 12 weeks of daily blueberry consumption was enough to improve scores on two different tests of cognitive function including memory. *Sources of information about ingredients come mostly from Wikipedia.org, searching for each item. 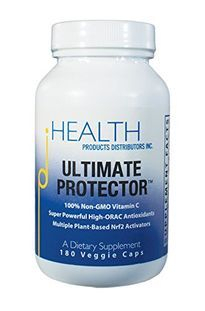 ULTIMATE PROTECTOR has the most (33) Nrf-2 stimulating ingredients, and it is the lowest price.